Across the country, the 4.9 million opportunity youth who are disconnected from both education and work are seeking paths to employment and career advancement. At the same time, employers are struggling to find talent for open positions. Gaining traction on these challenges requires partnerships between community-based organizations, employers, backbone organizations and other intermediaries, and other key stakeholders. 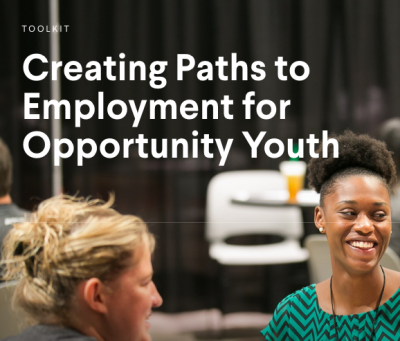 This toolkit is designed to help these partners work together to support youth on a path to careers. Employers looking to recruit, hire, and train the workforce of tomorrow can find information on how to meet their goals through partnerships with other sectors, and innovative approaches to improving company policies for better talent retention. Leaders of community-based organizations and other intermediaries will learn how to understand the regional labor market, engage employers, build cross-sector partnerships focused on opportunity youth employment, and develop a community strategy to increase employment opportunities for this population.